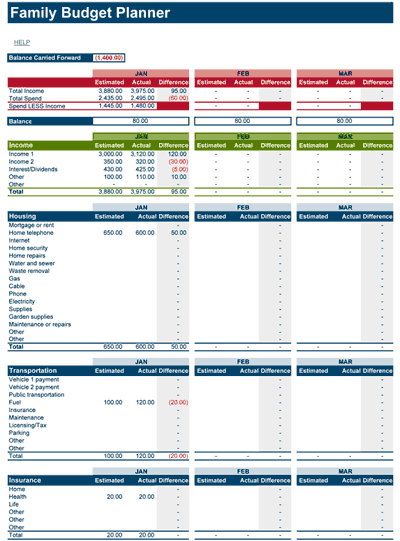 Family Budget Planner Template is a great spreadsheet for creating a yearly budget plan for your family. Budget Planning is essential for every family, who is serious about their financial future, savings, buying a car or a family house, putting kids to college and many other financial decisions, therefore this budget template is a must have tool in your financial tool box. Unlike other personal budget templates that you can find on our site, this budget planner was designed to reflect a simple day-to-day requirements of a family and to help in tracking your budget monthly, quarterly and annually. If you think that this family budget planner is not exactly right one for you, then I recommend to take a look at my Personal Budget Planner, Household Monthly Budget and Personal Monthly Budget planning templates, which can help to track your budget monthly, quarterly and annually and where you may find categories suitable for you and your family. 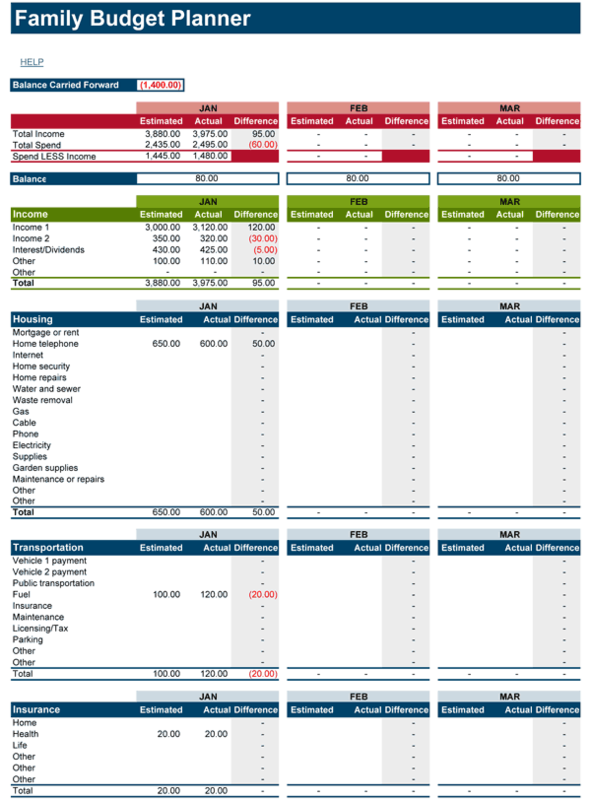 Also use in Excel Web App and Excel for iPad, iPhone or Office for Android! 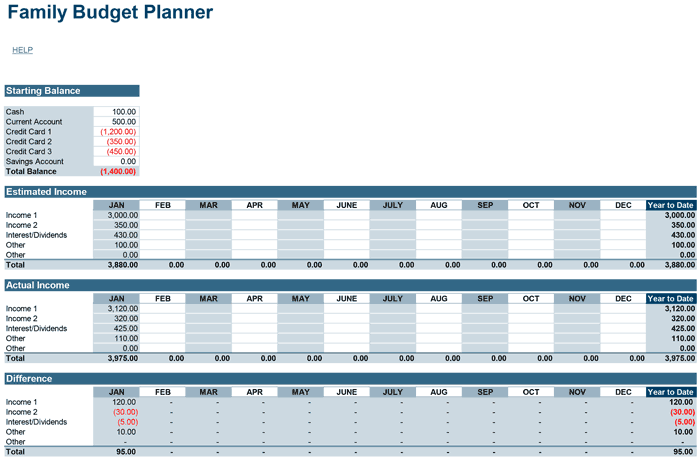 Family Budget Planner is a simple template that helps to track your budget monthly, quarterly and yearly. Income part that contains fields for projected income and for the actual income. This is usually is a first step to take when you start budgeting, since this helps to allocate amounts for the monthly spending and savings. TIP: Always plan to spend less to gain more or in other words to save more. Monthly spending. I have divided entire year on four quarters so that you do not get confused when planning your budget. This makes things easier when entering the amounts that do not have monthly consistency, such as some subscriptions or utility bills that you may receive once per quarter or annual tax returns or simply any payments without any consistency. 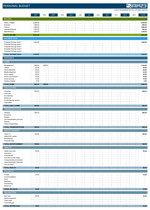 And at last is your spending total and results part, where you can see the estimated and actual spending for each category including any differences and results for each quarter of the entire year. 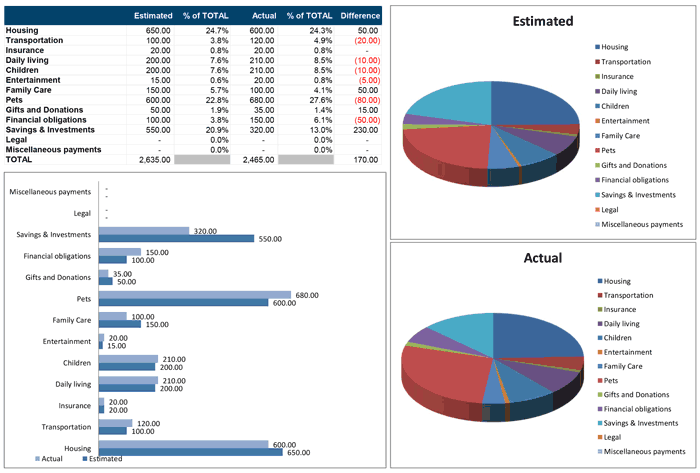 All amounts in this part of the spreadsheets are cumulative and will be updated every time you update your budget, which means that you will not have to wait for entire year to get your budget results, in fact obtaining information this way will help to achieve certain budget or/and saving goals. 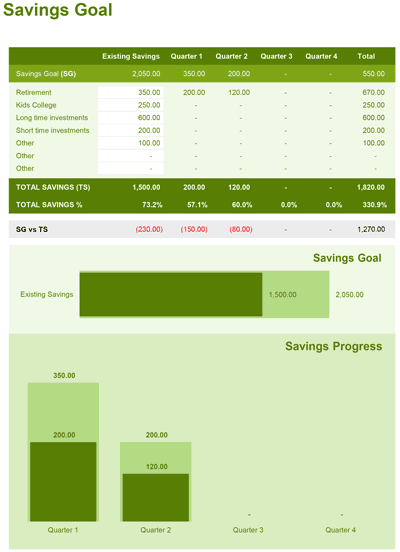 Savings Goal is one of the latest additions to this template and our response to requests submitted by many users of our family budget planner. Savings goal helps to set specific shot or long savings goals for various purposes, track your goals as you create your monthly budget and display all accumulated information in simple to read graphs. You can also enter any savings that you have made prior to the time you begun using budget. 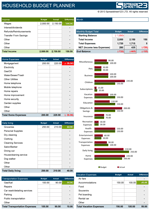 Quarterly figures are automatically entered for you and are copied from Savings & Investment category of every quarter. By creating a budget you can answer two main questions: Do I spend more than I earn? and What can I afford to spend? It can also help to identify the items and categories where you may be overspending, but the most important is that this budget template can help to make a future financial decisions and helps to concentrate on savings. There are two key questions that can only be answered by creating a budget. 1. Do you spend more than you earn? Consistently spending more than you earn will lead to a debt, creating a budget will help to identify categories where you overspend. 2. What can you afford to spend? Most of free budget tools online are concentrating on the monthly spend, which is not exactly a right thing to do, because some of the spending may not occur monthly or even yearly sometimes, therefore this particular template is specifically concentrated on tracking your budget monthly, quarterly and annually for more accuracy. Accurately prepared budget can enable you to spot the categories where you can save of spend. 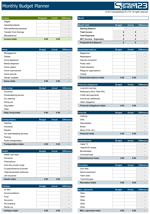 Personal Budget Spreadsheet - Yearly budget planner with categories for a single individual. 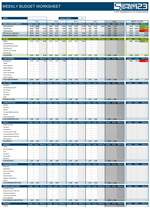 Household Budget Planner - More detailed spreadsheet designed for keeping up on household expense. Personal Monthly Budget - A monthly budget planner with with Government Tax Withholdings category.